A time-tested method of brewing coffee is to make it in a French press. This method is simple and is less time-consuming than other brewing methods. It’s also one of the best ways to extract all of the goodness that’s trapped inside the coffee grounds. Using a French press for brewing coffee is probably one of the better ways of making an exceptional cup of gourmet coffee. And that’s why it’s also quickly becoming one of the more popular methods of making a good cup of Joe. Using this method to make coffee is also pretty foolproof, as long as the right coffee is used. A good coffee for French press extractors will stimulate all of the senses and uplift coffee lovers in ways that automatic drip machines can’t. That’s the reason we’ve decided to list the top ten French press coffee ground products currently available, so the aficionado can not only find a coffee that fits this brewing method but also find one that tastes great. This dark French roast coffee is great for grinding and using in a French press. 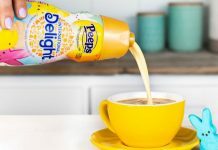 It has an extra bold flavor that doesn’t become bitter like other types of coffee. It’s also responsibly grown and roasted responsibly in Seattle. These beans are 100% Arabica bean and contain no additives or preservatives. They’ve been grown using sustainable methods and are packed in a responsible manner. And while they’re good beans to grind for presses, they’re also good for making coffee grounds for Aeropress machines, espresso makers and even drip coffee machines, depending on how the user decides to grind them up for their morning coffee. Smoky and full of complex flavors, this dark roast coffee is designed to help the user get the most out of their mornings. This ground coffee will deliver the caffeine kick that a person needs with their coffee, but isn’t bitter like some other types of dark coffee. And this product is packaged in a way that ensures that when it arrives at your door it’s as fresh as it can possibly be. These grounds are manufactured by a company that’s been hand-selecting and roasting quality beans from around the world since 1966. Taking a closer look at this coffee, it seems like they’ve continued the trend. People who love a strong cup of coffee in the morning should get a real boost out of this brand. It’s designed with twice the standard amount of caffeine that competing coffee grounds provide. Designed to punch the drinker square in the face, this coffee is a true dark coffee that’s grown to be bold and strong. It’s good for not only French press applications but also for use in automatic coffee machines as well. These grounds are made from hand-selected beans from artisanal farms located in Vietnam and are grown without the use of pesticides. This creates a bold, flavorful bean that’s professionally ground into Rude Awakening Coffee. This coarse ground coffee is made from specially sourced Arabica beans that have been grown in the rich volcanic soils of Costa Rica. This produces a bold and rich coffee that’s brimming with citrus and fruit undertones. It’s designed to be used in French presses and to not over-extract like many other kinds of ground coffees tend to do. This product produces an extremely interesting flavor and aroma profile that’s sure to help just about anyone start their day off. 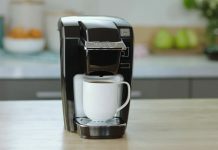 And if the user doesn’t want to make it in a press, it can also be used in an automatic coffee maker, too. Sourced from high-quality Arabica beans that have been grown at high-altitudes, this medium body coffee grind is suitable for use in your favorite French press or drip coffee maker. This coarse grind starts off as beans that are hand-picked and washed before they are sun-dried and sent to be roasted. They are then given a proper city roast before they are ground to European standards. This results in a medium-body coffee that has subtle citrus notes and has a low acid profile. It’s smooth and easy to drink and is designed to not be overly harsh on the coffee drinker’s stomach. Sourced from Arabica beans that are grown on progressive farms in Vietnam, these coffee beans are can be ground for a variety of different coffee applications including cold brew coffees, hot brews made in a French press or automatic drip machine, or for making tasty Vietnamese iced coffees. What’s really good about these coffee beans, however, is that they produce a coffee that’s both strong and delicious at the same time. They are designed to give the drinker a little bit of a kick but not to be harsh on the stomach. And they are designed to provide a flavor profile that’s different from the coffees produced by other coffee companies. These cold press coffee grounds come from a unique company that sources its products in unique ways. The beans used to make this grind are sourced from the world’s best organic growers and are roasted using a vintage German-built Probat roaster. That isn’t the only thing unique about this company, however. They also promise to plant a tree for every bag of coffee that’s purchased them. Probably the most important thing about this coffee though is the fact that it has a silky body that has floral and fruit undertones and a rich texture to it. This makes this a good coffee for just about any preparation method. Why settle for one particular type of coffee bean from one particular roaster when you can enjoy a different variety every day? That’s the idea behind this deluxe gourmet sampler pack. It contains 16 different coffees from different Seatle roasters. Some of the brands which can be found in this thoughtfully designed sample pack include Seattle Coffee Works, Lighthouse, Ladro, Zoka, Vita, and Herkimer. Each sampler contains about 1.8-pounds of fresh roasted whole coffee beans, along with tasting notes, brewing tips and profiles of the different roasters. Which makes it a great sample for the French press enthusiasts or to give as a gift to one. Packaged in a three-layer resealable bag that’s designed to keep the coffee grounds in it as fresh as possible, this dark roasted coffee for French press brewing methods is coarsely ground and is ready for immediate use. The coffee that’s inside of this bag has a sweet profile that’s not acidic at all and provides the drinker with a bold coffee taste. This grind is made from 100% Arabica beans that are sourced from Colombian growers. This dark roast coffee is not only suitable for French press coffees, however. It can also be used with cold brew methods and cold pressing methods, and can even be used in automatic drip machines. This is a whole bean coffee that has labeled itself to be the strongest coffee in the world. While we aren’t sure if that’s the case or not, one thing is for certain. These coffee beans can be used to make a great cup of French press coffee. This product is made using Fair Trade sources beans that are certified organic by the USDA and is also considered to be a Kosher coffee as well. It’s a dark roast that has double the caffeine of average coffee roasts and is designed to deliver a taste profile that’s strong but also smooth as well. The drinker is sure to get a kick out of this bold flavor that’s manufactured in small batches to ensure product freshness. The French press is often thought of as a baffling tool. At least, it is until a person discovers how to properly use one. From afar, the French press looks like it would be a difficult tool to use, but once someone gets into the details, they find it’s not so bad to use one. In fact, many people would say that it’s one of the easier ways to make coffee. While it may be an easy way to make a cup of coffee, that doesn’t mean that it’s completely fool-proof. Making a good cup of French Press coffee requires paying attention to small details and following some strongly prescribed steps. 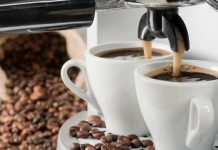 If things like water temperature and bean selection aren’t carefully considered, then the coffee lover can end up with a cup of Joe that’s bitter and murky. And those are things that one wouldn’t associate with a good cup of coffee. In order to help first-time French press operators make the best cup of coffee possible, we’ve decided to go over some of the things that need to be thought about before attempting to brew coffee this way and the steps that a person needs to do to brew an exceptional cup of coffee. With that being said, let’s not waste any more time and get right down to business. One of the first mistakes people make when buying coffee grounds for use in a French press is to buy grounds that are too fine for this application. Fine coffee grounds not only clogs coffee filters but also allows hot water to pass through them too quickly. However, a good coarse ground coffee will do the opposite. It will allow hot water to filter slowly and this will allow the essential oils to be properly extracted from the coffee grounds. 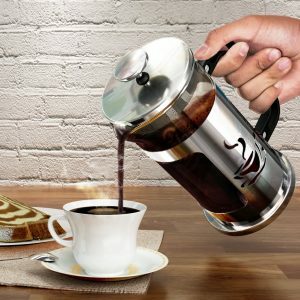 One question that often comes up when people are trying to figure out which coffee beans are best for a French press is: “Should I buy ground coffee or whole coffee beans?” Some people believe that only whole coffee beans should be purchased and that the French press operator should grind the beans themselves to ensure a proper grind. However, that’s isn’t necessary. Sure, grinding whole beans usually does make a better cup of coffee, but there are some ground coffees which work really well in a French press. if you don’t believe me, then all you have to do is look at the above top ten list of French press coffees. As you can see, there are plenty of ground coffees for French press coffee makers out there, and most of them are pretty good. One thing that’s often overlooked by first-time French press operators is the quality of the water. The better quality water that you use, the better the coffee is going to taste. Go ahead and taste the water that comes out of your taps. If it tastes alright to you, then go ahead and use it to make coffee. However, if you don’t like it, then consider buying a quality water filter and filtering the water before using it in your French press. This can mean all the difference when making a delicious cup of coffee. The French press needs to be cleaned on a regular basis, and coffee residue shouldn’t be allowed to ruin a good cup of coffee. So always make sure that your device is clean and ready to be used. After all, if there are old grounds left in the mesh filter, it will absolutely ruin your coffee. The coffee amount is another important consideration. Generally speaking, you’ll want to use about 3-tablespoons of coffee for 3-cups of coffee. If you’re brewing 4-cups, then you’ll need approximately 5-tablespoons. Of course, these are approximations, and you should adjust these amounts to your personal preferences. The proper water temperature for a perfect French press extraction is 205-degrees Fahrenheit. That water temperature is hot enough to leach out the essential oils out of your coffee grounds without also bringing out commonly bitter compounds. How do you know your water is 205-degrees Fahrenheit exactly? Well, there are two ways you can go about it. You can use a thermal thermometer to measure the temperature of the water, or you can use the boil and sit method. With this method, you bring your water to a boil and then you let it sit for 30-seconds. Your water temperature will have dropped down to 205-degrees in that amount of time. Now that you have your coffee grounds, your French press, and your tasty water, it’s now time to make the perfect cup of coffee. Below are the steps that you’ll need to follow. Step One – Rinse your French press. Take your hot water and fill the French press about a quarter of the way full. Now press the plunger down, swirl the water around and wait for 10-15 seconds. Once that’s been done, discard this rinse water. Step Two – Pour in your premeasured coffee grounds. Once you’ve added the coffee grounds, give the press a gentle shake to settle and even out the grounds. Step Three – Initiate the bloom. Pour in approximately half the water that you’re going to use. This will cause the coffee grounds to release their gases. This process creates a wonderful aroma and is known as the bloom. Wait for 30-seconds before proceeding to Step Four. Step Four – Stir the grounds. Stir the coffee mixture for about 5 to 10-seconds to break up the hard crust of grounds that formed in the previous step. This will serve to ensure that the water and the coffee grounds mix properly. Step Five – Begin the steeping phase of the coffee making process. Pour in the rest of the water and put the lid on the French press with the plunger all the way up. Set a timer for 4-minutes and allow the coffee to gently steep. Step Six – Begin extraction. Once the timer has expired, it’s now time to extract the coffee. Slowly push the plunger all the way down to the bottom of the press. This will squeeze out the remaining essential oils and filter out the coffee grounds. Step Seven – Serve immediately. Once the coffee has been extracted, it’s now time to serve it. Be sure to serve it immediately. If you don’t, then the French press will turn your now perfect cup of coffee into a very bitter tasting beverage. So serve it immediately and enjoy the tasty cup of Joe that you have just brewed. You have now learned how to make a great coffee for French press machines using the best brewing methods.